We’re thrilled to announce our newest Relationship Coffee: Tiga Raja Mill from Simalungun, Sumatra, in Indonesia. It’s a full-bodied coffee with notes of brown sugar, chocolate, and orange, and a lingering aftertaste. It’s available now in our Current Offerings! Amazingly, this is the first coffee Sustainable Harvest® has ever offered from Indonesia. 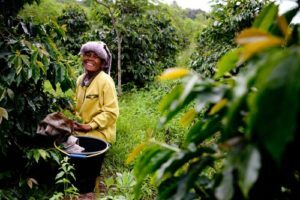 Though Sumatrans are a staple offering and flavor profile in the coffee industry, it has been historically difficult to implement traceability systems in the region. Because the Relationship Coffee Model places the utmost importance on transparent, traceable sourcing, bringing in coffees from Indonesia was a steep challenge. We’ve sourced our first Indonesian coffee through a partnership with Five Senses Coffee in Australia, which helped set up the Tiga Raja Mill, a small, specialty-focused mill that collects coffee from smallholder farmers in and around Simalungun. Traceability. Most coffee farmers in Indonesia grow a very small amount of coffee alongside crops like tomatoes, chili peppers, and ginger. The combined remoteness of their farms and fragmented production system have made it very difficult to trace Indonesian coffee. 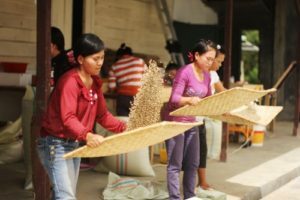 Tiga Raja sources coffee from 600 to 1,000 farmers in Simalungun, who are organized into commissaries through a credit union. It’s through these commissaries that traceability is enacted, as each lot can be traced back to the group of smallholders that produced it. Quality. Simalungun has many of the natural ingredients needed to produce high-quality coffee, including, temperate climates, high altitude, and rich volcanic soils. The mill buys parchment coffee from farmers, who are trained on how to achieve quality and paid above-market rates for high-quality parchment. The carefully selected mill operators then process the coffee, using their vast knowledge of the quality expectations of specialty roasters and coffee consumers. Like most Sumatran coffee, Tiga Raja is processed using the wet-hulled method. We’re very excited to offer our first-ever Indonesian coffee to you! We currently have 300 bags of Tiga Raja available in our Current Offerings, warehoused at the Annex in San Leandro, Calif. For more information on this special coffee, email trade@sustainableharvest.com.